Carbon Copy wedding and function band is a fantastic Four piece outfit with the ability to entertain any audience. The band’s repertoire covers a wide range of music from 60’s pop classics right through 70’s 80’s 90’s to the best chart music of today, whether it be rock, pop soul or big ballads! This is the band for your special event. Without an enviable reputation as one of the finest live function bands currently playing on the Scottish wedding band circuit. They have played in every type of venue from top Hotels, Town Halls, Restaurants, Function suites to nightclubs and Pubs. With great vocals and superb musicianship Carbon Copy will fill any dance floor and entertain your guests from start to finish. 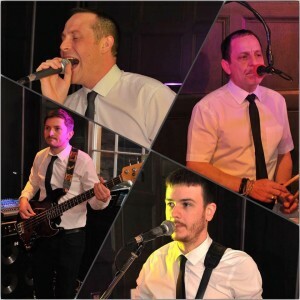 No matter what the occasion the band will tailor their set to suit your needs on the night. Carbon Copy’s energetic live sets are flexible and they will work with you to accommodate your event’s timing and will play background music when the band breaks. The band use only high end audio and the finest musical equipment to ensure they always deliver a top class sound. Truly a band for every occasion! “Carbon Copy went down a storm at our Christmas dance. A few of our members thought they were the best live band we have ever had at the club”.